The Afro-Cuban Big Band Play-Along book/CD gives the drummer/percussionist an opportunity to play contemporary Afro-Cuban music in a big band setting. The book and CD includes six charts from the Grammy® award-winning Caribbean Jazz Project album, Afro-Bop Alliance (featuring Dave Samuels). The tracks, minus the drum/percussion parts, will give the player an opportunity to solo and experiment with a variety of groove and/or style variations. A play-along CD containing tracks from the Grammy award-winning Caribbean Jazz Project album, Afro-Bop Alliance. Original charts for each tune. An analysis of style variations and drum grooves. Solo vamps to improvise over. Afro-Cuban Big Band Play-Along, by drummer / author / educator, Joe McCarthy, is a fantastic play-along package published by Alfred Music Publishing. This is the perfect play-along series for the big band drummer, providing an opportunity to play contemporary Afro-Cuban music with a full big band AND a traditional Afro-Cuban percussion section (consisting of Timbales, Congas, Bongos and auxiliary percussion). The play-along CD comes with six killer tunes from the Afro-Bop Alliance album, covering everything from Afro-Cuban 12/8, Cha-Cha-Cha and Mambo, to a hybrid groove (Latin fusion) and Bossa Nova. As typical with most play-alongs, all of the tunes are mixed with and without drums. Titles from the CD include: "Afro Green", "Naima", "Rendezvous", "Soul Sauce", "Picture Frame" and "Bemsha Swing". The book comes with drum charts for each of the six tunes; all are well notated and follow the traditional approach to big band drum notation. The charts are loose in the book, so it's easy to place them on a music stand as you practice and perform each tune. Also in the book, Joe supplies a brief synopsis of each tune and its sections, explaining his approach and notating the basic (skeleton) drum groove used. I highly recommend Afro-Cuban Big Band Play-Along Book/CD for intermediate to advanced players who desire to go deeper into this beautiful music genre. 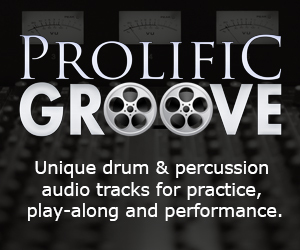 Percussionists as well as drummers will gain much by analyzing the recordings and groove transcriptions, not to mention the play-along benefits. I'm personally going to enjoy working with this play-along for a very long time ... and can't wait to go pick-up the full album!